Have you ever wanted to do watercolor painting, but found it intimidating? Pattiewack discovered a way to get the look of watercolor without the complication! 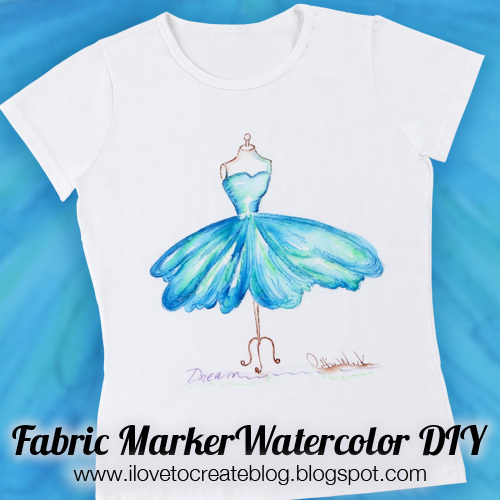 You simply use Tulip Fabric Markers, a paintbrush and water! It's that easy and she shows you step by step how to make this pretty dress shirt (click HERE for the pattern). Simple and fun! Do you think you'll give it a try? I really LOVE the watercolour look you have achieved! !I have tried it whith regular fabric paint but this is lot much easier.Thanks for sharing! Hі there, You have dοne а fantastic job. I'll definitely digg it and personally recommend to my friends. I'm сοnfіdent thеy'll be benefited from this web site. I understand practicing your technique first, but is there any reason to paint on a practice piece of fabric first and then use that as your tracing piece on the real t-shirt? Couldn't we just print any picture we like and trace in on to the t-shirt? I've tried painting watercolor on fabric with several different paints in the far past and none ever came out right. I think this may be the magic formula! Hey you are doing a good job. thank you so much for share this.